I slipped and fell in a grocery store on some kind of liquid in the aisle. Do I have a case? It depends. And by the way, this is a very, very common type of personal injury that our Syracuse New York lawyers handle. If the liquid you slipped on was spilt by a shopper and had been there for only a short period of time, then you probably have no case. Although the store owner is required to take reasonable efforts to ensure that there are no hazards in the store, the store cannot be expected to find all such spills immediately when they occur. Generally the grocery store or supermarket must have some kind of procedure for inspecting the aisles for spills and other hazards on a regular basis, say every half an hour. And of course the store must clean up spills that they find. Therefore, if you can prove that the spill had been there for some time, say for at least a half an hour, then you can probably win your case. The problem is proving how long it was there. Alternatively, if you can prove that store employees were aware of the spill for even a short period of time, but did not clean it up, then you have a good case. Further, if a store employee caused the spill, the store is almost always liable, even if the spill was there for only a short time. But again, the problem is proving this. In sum, whether your slip and fall in the supermarket or grocery story will result in a good case depends largely upon (1) who caused the spill (another customer or a store employee); (2) how long the spill was there without being cleaned up; and (3) whether store employees were aware of the spill. I slipped on ice or snow at a restaurant, or at my neighbors, or at the mall. Are they liable to me for my injuries? Not always. This is one of the most misunderstood areas of personal injury law. Our Syracuse New York snow-and-ice case lawyers see many of these injuries because of the snowy, icy winters we have up here. Many people believe that the owner of the property is automatically liable for slip and falls on ice on their property. Nothing could be further from the truth. These are often tough cases, especially in upstate New York where it is virtually impossible to remove all ice and snow at all times from property in winter months. Because it is so hard for a property owner to keep up with all the snow and ice that accumulates in the winter months, the law says that a property owner must act only “reasonably” in removing snow and ice – and is not liable for slip and falls on ice or snow if he at least acted reasonably. This usually means that a property owner will be found liable if the snow or ice was there for some time but the owner failed to remove it. Often the owner will be found not liable if the snow or ice was very recently formed. On the other hand, even with recently formed ice, the owner may be found liable if he failed to alleviate conditions that tended to create icy conditions. For example, perhaps the owner failed to fix an old gutter that was directing rain water onto the walkway (instead of onto the lawn) where the ice formed. Or perhaps puddles tended to form in this area (which would then freeze) because the owner had failed to correct a drainage problem on the property. Or the owner might have piled up snow that tended to melt and flow over to the area where the ice formed. An argument can be made that he should have piled the snow somewhere where the melting snow would not run to form puddles that would latter freeze. All of these possibilities must be investigated. Also, the weather records for the days leading up to the slip and fall must be examined. These will often show whether the ice was recently formed (when temperatures dropped) or whether it had been there for a while (if temperatures had stayed below freezing for the days leading up to the slip and fall). Is the Owner of the Property Where I Slipped and Fell Automatically Liable for my Injuries? No. Just because you slipped and fell on someone's property - whether it be a commercial property or a private one - does not make them liable. You have to prove it was their fault, at least in part. 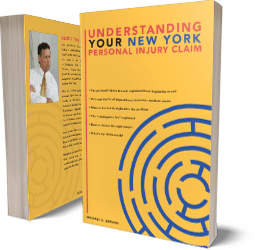 New York slip-and-fall injury lawyers, whether here in the Syracuse area or anywhere else in New York, should have experience in collecting and putting in evidence that shows the owner was at fault. How Do I Prove the Owner of the Property was Negligent in Causing my Slip-and-Fall Accident? Essentially, your New York Slip-and-fall lawyer, whether in the Syracuse area or elsewhere in New York, will have to prove that the owner - or whoever controlled the property (such as a commercial tenant) - failed to take reasonable steps to keep the property in a reasonably safe condition. How Do I Prove the Owner Liable for my Slip-and-Fall on a Walkway or Parking Lot? If the landowner failed to salt and plow to remove snow and ice, and you slip on that snow and ice, you might be able to prove that the landowner was negligent. But the law does not require the landowner to IMMEDIATELY remove snow and ice as it falls or forms. The law says the owner must do so in a reasonably timely manner. During an ongoing storm, for example, the owner is not required to remove the snow and ice as it falls and forms. Depending on the circumstances, it might be more reasonable to give the owner an hour or two after the storm stops to remove the snow and ice. How Do I Prove the Owner Liable for my Slip-and-Fall on a Liquid Spill? If the slip-and-fall was caused by some kind of liquid that was spilled on the floor, in a store, for example, you would have to prove that the owner or its employee spilled the liquid, or that, if someone else (such as a customer in a store), spilled the liquid, that the owner knew about the spill and still failed to clean it up, or else that the spill was there for a period of time so that the owner, through reasonable inspections, should have discovered the spill. How Do I Prove the Owner Liable for my Slip-and-Fall on a Frozen Puddle? If the slip and fall is out in a parking lot, on a frozen puddle, for example, your lawyer may hire a drainage expert to show that the owner did not have a proper drainage system to prevent puddles from forming (and then freezing). 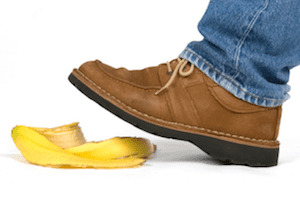 How Do I Prove the Owner Liable for my Slip-and-Fall on a Wet Entrance to a Store? Slips and falls are very common at the entrance to a store on rainy days or when there is snow on the ground. The public drags moisture into the entrance floor on their shoes. The owner can't prevent that entirely, but he can and should put enough dry mats at the entrance to absorb most of the water, and should regularly check to see if moisture is being dragged in past the mats, and should have employees mop regularly. Also, "wet floor" signs need to be placed at the entrance. If the owner fails to do any of these things, and you slip and fall at the entrance, our Syracuse slip-and-fall injury lawyers can help you establish a claim against the owner. Does the Owner of the Property Have to Warn Me of Slippery Surfaces? Yes. Sometimes the owner of the property can't actually remove the slip hazard completely - for example, if an employee is mopping a floor. When that happens, the owner must warn visitors of the hazard by placing "wet floor" signs or cones. If the owner fails to do so - or fails to place these where they will adequately warn the public, the owner can be held liable. Why are There So Many Ways of Proving the Owner of the Property "Negligent" in Slip-and-Fall cases? There are many different circumstances causing slippery conditions, and thus there are many ways of proving the owner negligent in causing them. But what ties all these different ways of proving negligence together is this: The owner has to make reasonable efforts to keep the property reasonably safe. If you can show the owner did not do that, and you fell as a result, you have proved liability. You can prove this by showing he did not maintain a safe drainage system, or failed to inspect the store isles for spills on a regular basis, or failed to remove snow and ice in a timely manner, or in many other manners. If you think you might have a slip-and-fall case in New York State, don't hesitate to contact the Syracuse slip-and-fall injury lawyers at Michaels & Smolak for a free consultation.